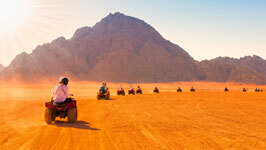 Race across the beautiful deserts that surround Hurghada on our exhilarating desert buggy safari. 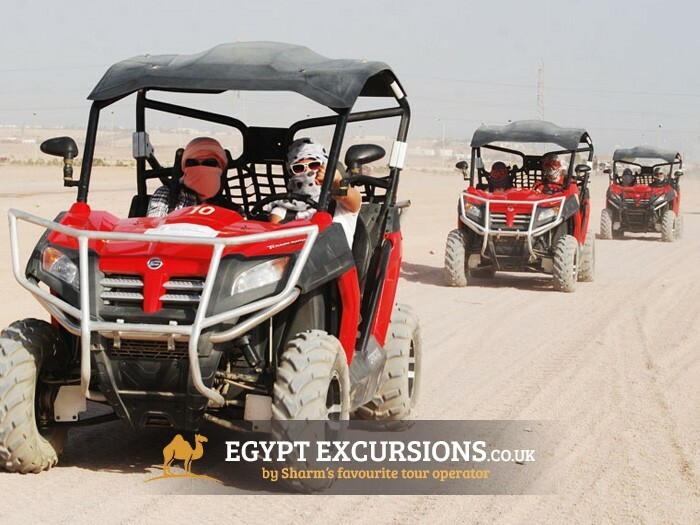 You'll get a chance to take in the majestic sunrise over the desert as you drive your buggy through vast flats and the rocky terrain of Hurghada's desert. 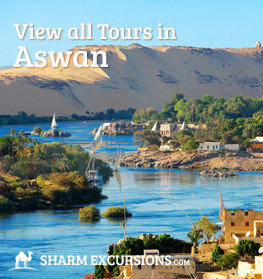 We'll pick you up from your hotel in either the morning or afternoon, and take drive you in a comfortable, air-conditioned minibus to the buggy centre just on the outskirts of Hurghada town. 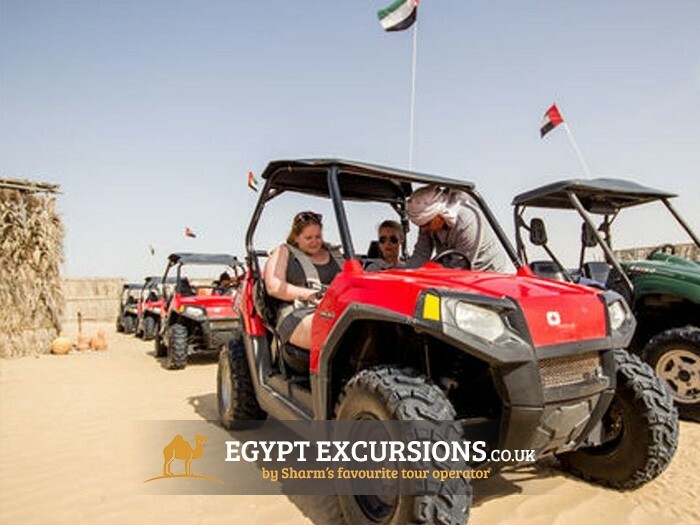 Once at the buggy centre, you'll receive a brief safety demonstration on how to safely use your buggy before beginning your journey into the beautiful deserts, home to the Bedouin people for thousands of years. 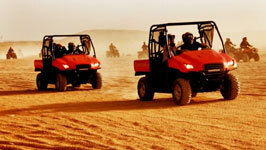 Buggy Safari - What will I be driving? 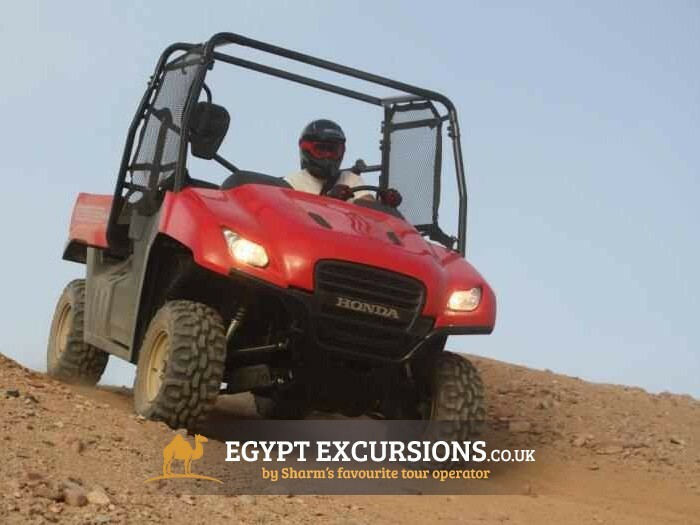 A cross between a quad bike and a 4x4 jeep, these fantastic buggies offer up to two passengers the ability to sit side-by-side whilst experiencing the thrills of a quad bike, but with the safety of an enclosed vehicle. 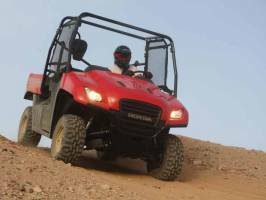 With a fully automatic transmission, our desert buggies are eay enough for just about anyone to drive, and boasting a brilliant 4x4 system, you'll find there's not much of the mountainous desert these bad boys can't scale! 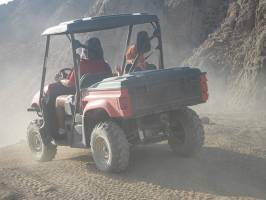 Where will the Buggy Safari take us? 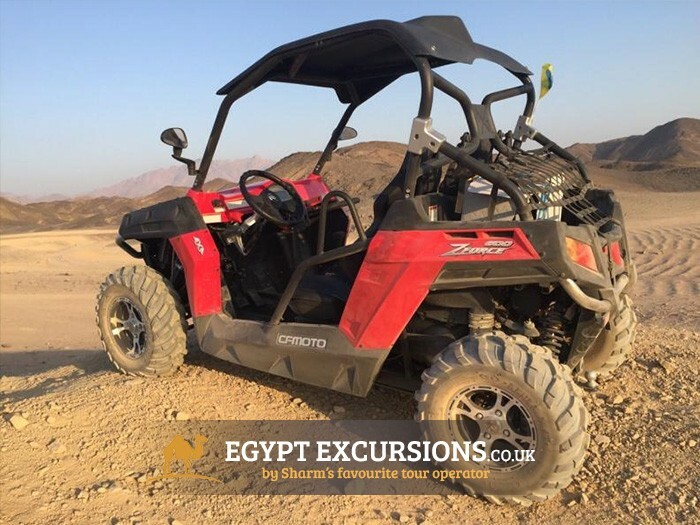 From the buggy centre on the outskirts of Hurghada, we'll travel into the deserts with it's vast stretched of flat sand and dramatic mountains and hills. 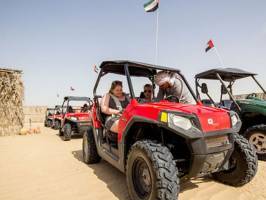 As we travel through the desert you'll get the chance to drive the buggy over different terrains at different speeds, experiencing the best the desert has to offer. 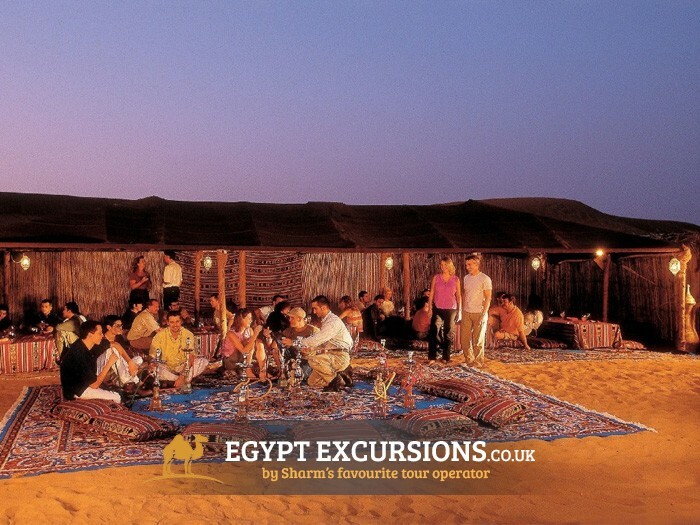 We'll travel into the beautiful deserts that surround Hurghada until we reach an authentic Bedouin village, where you'll have a rest from the buggy and drink traditional Egyptian tea in the camp, and if you like, smoke a shisha. 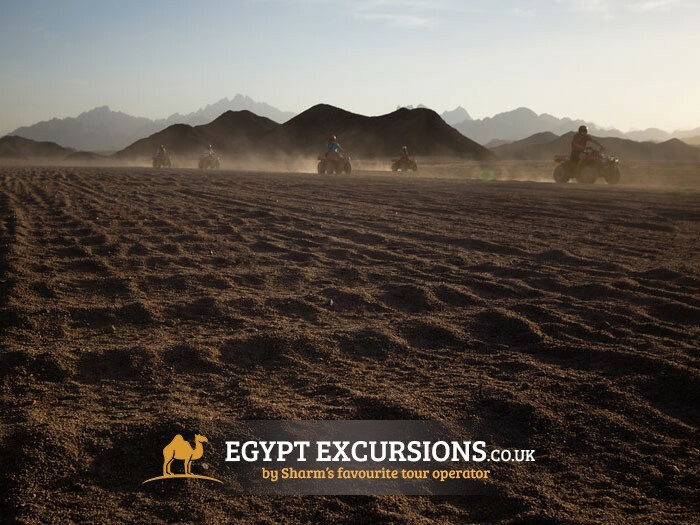 If you decide to book our Hurghada Desert Buggy Safari in the morning, the trip will be timed so that you get to watch the sunrise over the majestic desert, making this trip a fantastic mix of fun and beauty. 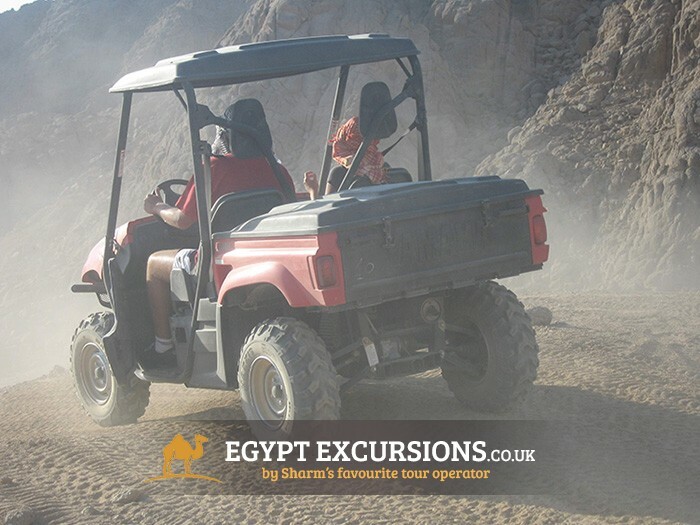 After the desert safari we'll head back to the buggy centre, from where an air-conditioned mini bus will be waiting to take you back to your hotel. 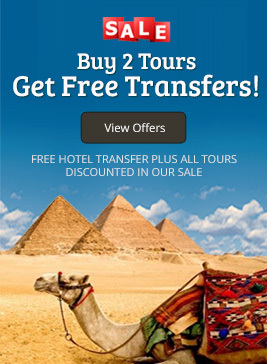 Tour Priced per Vehicle! 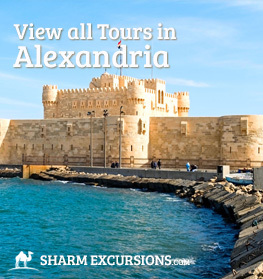 This tours is priced per vehicle, not per person, so you can have someone next to you for free! - As long as they don't mind your driving that is! Sand dune buggy We had a great morning in a safe buggy (helmets, goggles, scarves and seatbelts provided) negotiating the bumps and dust of the sand dunes just outside Hurghada. 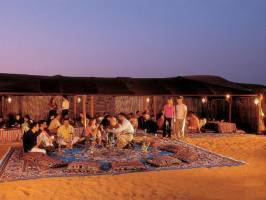 Went on to a Bedouin camp, with camels, tea, cold drinks and snake enclosure. 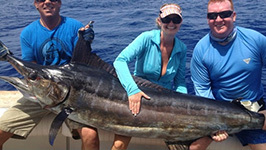 This is physically quite demanding! 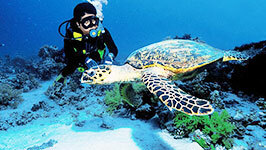 Thought I must be breaking all speed limits but the nature of the terrain just makes it feel like this. A good choice. This day out was one of my best experiences. We were picked up in a minivan dropped off about and hour away from our hotel to the dessert to a camp were we spent the day enjoying thrilling buggy rides. 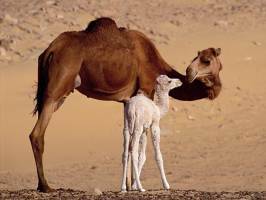 Then a safari drive across the bumpy dessert to a bedioun village were we rode beautiful camels learnt the history. We then went back to the centre for a bbq lunch, fabulas and then gathered for some folk entertainment great family day out and a great experience. Thank you! Me and my son went and we had a brilliant day! Make sure u have a scarf, sunglasses, wear trainers and take plenty to drink. 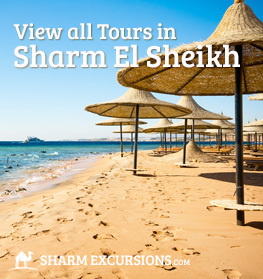 We went to Hurghada when all the flights to Sharm El Sheikh had been cancelled by EasyJet in March 2015 and we were give the opportunity to re-arrange our holiday. 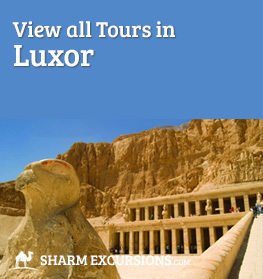 We were pleasantly surprised by Hurghada, it seemed a lot less busy than Sharm El Sheikh and had a more relaxed atmosphere as others have mentioned. 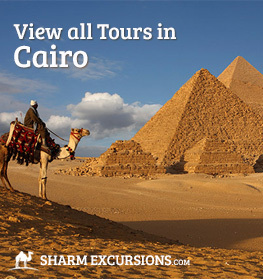 Before leaving we booked 3 trips with Egypt Excursions on the recommendation of a friend who had used them before and stayed in contact with Mohammed. 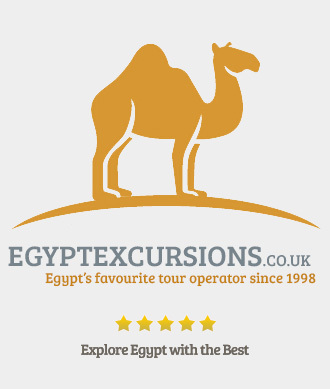 On booking we found him to be very friendly and helpful with good English - we got the impression he was happy to have the business from us as he had a lot of time for us and we exchanged a number of emails before we left about pickup and the details of our tours. 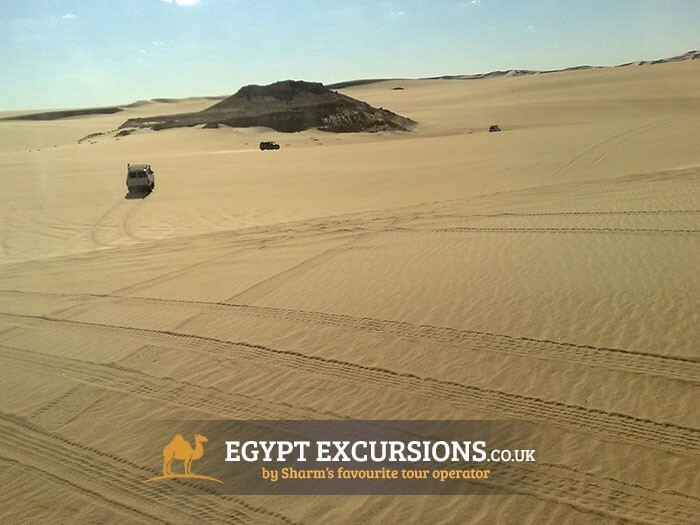 The first tour we booked was the 4x4 buggy trip in the desert which was our bit of action for the holiday! 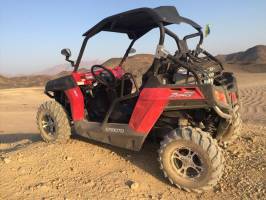 The buggy was great fun and really fast! 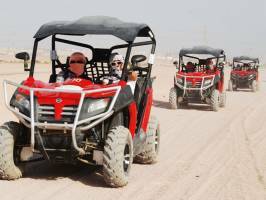 There were 2 seats for me and my fiancée and the chance to swap driver halfway through the tour at the Bedouin Village although I didn't take up on this chance! 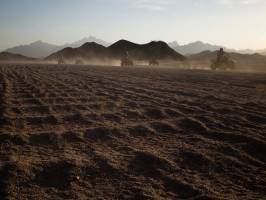 The deserts that surround Hurghada are surprisingly beautiful and a great place to see the real Egypt and it's beautiful sunrise. 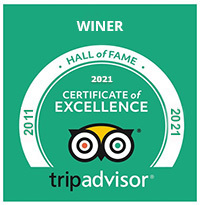 We would gladly book again. Runs On: Every Day Hotel Pickup: 01:00 pm. Hotel Return: 05:30 pm.